LM: Vision: The co-founders enjoying an ice-cream because sometimes the car industry can be tough, and you never want to lose sight of the sweet taste of cool cars. 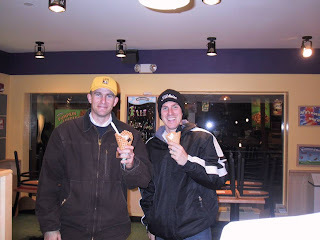 Now there is a story behind this Ben & Jerry's ice cream. It was cold that night in Aspen, and after a long day of meeting with Nate at the Rocky Mountain Institute and Jon & Dave at Fiberforge it was time to find some food. We found a pizza joint (New York Pizza) in Downtown Aspen and then had some time to burn before our engagement with Sacha Baron Cohen, so Jay suggested ice cream. We were probably two of the last customers in the year - it was cold! In fact, Cheap Oakley Sunglasses some websites, if you have purchased a lot of things, to provide fake Oakley glasses free shipping. This can be a significant saving. Fake Oakleys You do not need to be clarified and rich.